Immediately you come across the Samsung Galaxy Note 8, you are likely to fall in love with it. The manufacturer has packed this device with many impressive features such as a premium casing to ensure that it attracts more people. However, the premium design and unique features do not come cheap. You should be ready to pay an extra amount for them. The Samsung Note 8 is currently retailing at $930. To purchase a product with such a hefty price, anyone would like to start by exploring the merits and merits. Actually, they should help you decide on whether to proceed with your purchase or forget it. As far as the product’s features are concerned, there is no dearth of them in the super flagship. The Samsung Galaxy Note 8 showcases unarguably the best software and hardware from Samsung. The main features are as follows. The power dual-camera setup is a big advantage. The 12mp dual-lens main camera is a typical telephoto-wide angle configuration with one of its lens being the wide angle lens and the other the telephoto lens. The manufacturer also adds Optical Image Stabilization feature for both lenses. Even more, with the device, you will capture more images with artificial field depth. Control the bokeh intensity effect before you start capturing images or after capturing them. Some of the features are not available with any other Samsung device in the market. The 6.2-inch big infinity display does not increase the device’s size. Despite the large display, the Galaxy Note 8 is manageable, thanks to the almost bezel-less design. The display’s resolution stands at 1440×2960 pixels which reduce to a super telling 521 ppi, which is more than you need for entertainment and gaming tasks. Even though the Samsung Galaxy Note 8 is the second device to showcase the Snapdragon 835 process, it is the first to feature 6GB of RAM. Before the device, Samsung supplied the Galaxy S8 with 6GB of RAM, but that was in a few countries. The Galaxy Note 8 is available globally with the SD 835 chipset and 6GB of RAM. That is a strong configuration that will give the contenders a bunk for their money. S Pen is a signature feature of the Note series and Samsung has been adding it in every new device. The Galaxy Note 8 is not different from the others. The S Pen in the device allows the user to do several interesting things that were previously impossible. A quick example: with the S Pen feature, you can send Live Messages. In other words, you can draw animated drawings on the Note 8 screen and send them. You can also write on the large screen when still locked. The manufacturer has assembled the device in a unique way so that it will look more beautiful each time you hold it in your hand. What’s more, the device is more manageable than many other mobile devices in the market. Its rectangular form factor plus the thin design helps you achieve a firmer grip over it. Again, both the S Pen and Galaxy Note 8 feature the IP68 waterproof protection. Therefore, you can take the device to the swimming pool or rain. That is a great feature for creative, mainly because imagination strikes in almost any place. The fingerprint sensor is close to the device’s camera setup. After Samsung received some reviewer’s feedback, they increased the distance between the sensor and camera lenses. However, the positioning is not a good thing from an ergonomic standpoint. After releasing the Note 7 fiasco, Samsung had no other choice rather than getting all things right. They decided to work harder and released the Galaxy Note 8, which has a small 3,300 mAh battery. Even though they decreased the battery capacity, they increased all other things in the device considerably. From the camera to the display, everything needs more power to function better. A larger battery would have been better in the device. Most Samsung enthusiasts expected an IR blaster and stereo speakers on the Samsung Galaxy Note 8. However, Samsung did not bother to include any of the two in the device. That alone is a huge setback for the enthusiasts. Maybe, they did that because of the product’s small battery. Whatever the reason, things will remain that way in the Galaxy Note 8. The specs should be your first consideration when purchasing a mobile device. 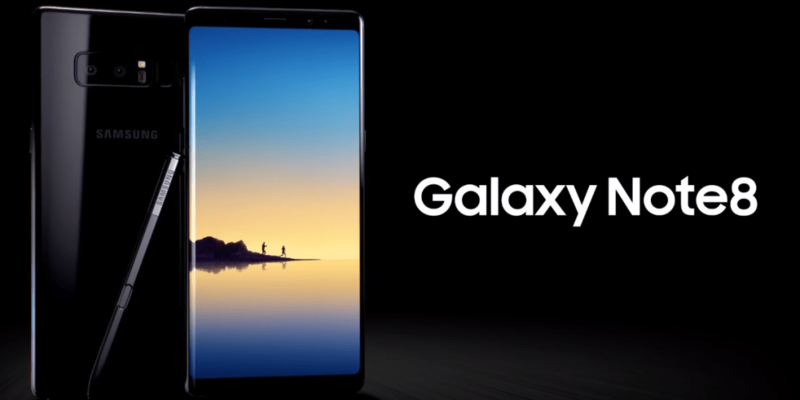 The Samsung Galaxy Note 8 comes with a 6.3-inch Super AMOLED Infinity display (1440x2960px resolution), 12mp dual-lens rear camera, 8mp front camera, 6GB of RAM, Snapdragon 835 processor and a rear-facing fingerprint sensor. The device also comes with an iris sensor. Smaller battery, hence you will need to recharge it more often. It is evident that the Samsung Galaxy Note 8 has some limitations. However, the benefits outweigh the problems and jointly make it the best smartphone from Samsung today. If you are not worried about the high price, it is actually among the best devices your money can buy today. With the device, you will see bigger pictures and communicate in a better way. The larger screen means larger space for greater things. The screen is the largest screen on Note devices and will fit in your hand easily. And with the S Pen, you will express yourself in various ways that will definitely make a difference. Start by drawing emojis to express your feeling and write messages on your photos and send them as handwritten notes. Use the S Pen to do everything that matters.